The 1-508 PIR’s priority for the past two weeks has been the OPFOR support to 2 BCT’s FTX, recovery operations, and Fort AP Hill OPT and Swift Response planning. The past two weeks provided incredible opportunity for 1-508 PIR to increase its small unit tactics proficiency, BN and Company level mission command systems all while balancing maintenance tasks and managing long range planning. Our participation during 2nd Brigade’s most recent field training exercise allowed small unit leaders the opportunity to execute offensive and defensive battle drills, improve internal communications and step-up during “leader-down” scenarios. Our Juliet Company pushed hard to conduct support tasks while synchronizing with our S4 section to maintain unit maintenance requirements. While training progressed here on Fort Bragg, Battalion leaders/planners travelled to Latvia and Poland refining plans for this summer’s upcoming Swift Response exercise, which will include a company CALFEX. This past week, 1-508 completed FORSCOM IG inspection with BN medics, UMOs, CCOs, and S2 personnel participating in group discussions about unit readiness. Line of Effort #1: “Fight Tonight”. Approximately 20 Paratroopers from 1-508 PIR conducted M4 marksmanship training partnered with PEO Soldier. They focused on using the STORM SLX in conjunction with the M4 carbine to improve accuracy and lethality while engaging targets at night. The storm SLX provides a traditional weapons aiming laser with range finding capability in a lightweight solution for individual paratroopers rifles. B/1-508 PIR fielded the winning squad in the 3BCT Best Squad Competition on 20 February, proving that B/1-508 PIR and, by extension, 1-508 PIR is the most physically fit, tactically sound, and lethal organization in the BDE. Medics SGT Putz, CPL Johnson, and SPC Louie are currently in Table VIII training. SGT Gentry and SPC Rowland are at Paramedic school. The medical section is currently training 40 additional Paratroopers on CLS +. 40 Paratroopers trained CLS+ this past reporting period. During 2BCT OPFOR support, iMBITRs were issued to Platoon Sergeants and above. This was the first company sized training event in which iMBITRs were tested in conjunction with the TW400 radios issued to Team Leaders and above. The ability to utilize both wide band and narrow band nets for each iMBITR user significantly increased the reporting timeliness and situational awareness for the companies' leaders. It also provided the opportunity for Paratroopers to provide feedback to the NWFI team, allowing for continued improvement to the system. Battalion S6 NCOIC, SFC Stack attended the Saber Strike Main Planning Conference ISO Swift Response 18 over 11-16 FEB 18. 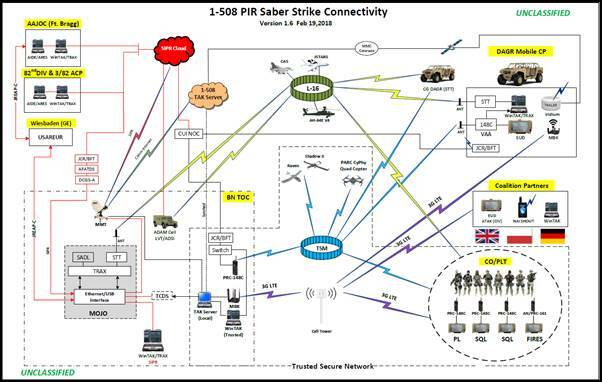 Collaborating with partnered nations, SFC Stack helped draft an initial SR18 network diagram that shows the integration of all communication equipment during the exercise. He used his experience of NWFI equipment to share TTPs with S6 personnel from 173rd and 2CR as well as Mr. Joe Dames (Net warrior FSR), to assist with a smooth fielding and employment of the NWFI systems in their AO. During the Conference, he also worked with the BDE ESM to ensure proper frequency clearances for all battalion radios and assisted the 3BCT team to understand how to employ the GRRIPS, MMT, and other digital platforms during SR18. A/1-508 PIR conducted an Area Defense on OBJ Raiders (Range 74 and Live Fire Village) during 2BCT OPFOR support from 11-13FEB. Two Platoons with attached HUMINT and RAVEN Team were tasked with defending Range 74 while one Platoon and seven Engineers were tasked with conducting a defense in depth on Life Fire Village. During all three iterations of the defense, the attacking 2BCT BLUFOR initiated their attack utilizing different tactics, forcing our defending force to adapt to a free thinking enemy. B/1-508 PIR executed decentralized operations driven by team sized elements both in the offense and defense during 2BCT OPFOR support. The Company's goal was to give a task, purpose, and Commander's intent to the squad leaders allowing for maximum planning and critical decision making at the Squad Level. The Squad Leaders sought for maximum control at the Team level in execution. The end state was highly empowered Squads demonstrating their lethality and integrating all assets available to them. Battle Company saw an impressive amount of effective fire missions demonstrating the Team's level of performance when working with indirect fires. 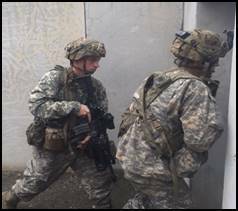 C/1-508 PIR supported the 2BCT FTX by executing a Company Defense and Attack on Luzon DZ and defending Platoon Objectives. The Company was able to incorporate a Brave Troop Platoon and Delta Platoon into their Company mission on Luzon DZ, followed by each Platoon operating autonomously on three separate objectives for the remainder of the FTX. This training event allowed Platoons to execute TLPs, Fires Integration, and Small Unit Tactics. Overall, the training event provided an excellent opportunity for Platoon and Squad Leadership to practice the individual training they have been executing these past months. D/1-508 PIR participated in the 2BCT OPFOR mission, both as organic PLTs operating independently and as part of company teams. Many of the Paratroopers particularly enjoyed the opportunity to operate at a small unit level against a unit with similar capabilities. This exercise reinforced the importance of having a foundation in dismounted tactics and reinforced lessons learned during recent training events. HHC/1-508 PIR employed Scouts and Mortars during 2BCT OPFOR support, playing a critical role in facilitating their training. The mortar platoon integrated into the companies as an “un-conventional mortar platform” and supported company missions. Scouts were designated as “fire-markers” and worked to facilitate both Blue and OPFOR fire missions to replicate timely and accurate fires. 1-508 PIR simultaneously executed maintenance in accordance with the SRTC maintenance calendar while also executing its Deployment Readiness Exercise, supporting the Operation FALCON STORM as the 2BCT OPFOR, and conducting Juliet CO's change of command inventories. To achieve these simultaneous operations, the maintenance platoon executed twenty-four hour operations from 09FEB-13FEB. During the exercise, the platoon conducted over six contact and recovery missions. While J Co sustained the Battalion forward, the automotive section completed nine scheduled services, including two LMTVs, three trailers, two Humvees, and all CROWS systems and the small-arms repair section completed one company's worth of quarterly services and one company's worth of NVG semi-annual services. The maintenance platoon collectively maintained a balance of one overdue service, which the platoon will completed NLT 23 FEB. To help fund the Battalion, the shop office section turned in 22,354 worth of credit on our ORIL report, and work orders in GCSS-Army indicated over 350 direct labor man hours completed for both scheduled and unscheduled services across all sections. After the completion of 2BCT OPFOR, the Battalion focused on recovery and preparation for AP Hill. The companies completed lateral transfers and turn -ns for five pieces of equipment, including one of the first ever lateral transfers to 223rd Quartermaster. Additionally, the Battalion submitted disposition instructions for eight pieces of the equipment opening in DST. The maintenance platoon reduced the number of complete parts on hand not installed from 21 to 6, with the platoon on a glide path to reach zero by next week. Finally, the maintenance platoon has established a plan to reduce the number of NMC over 60 from 105 to 70 by the end of next week. All these efforts will set the Battalion up for success in preparation for the OPT to AP Hill in March. 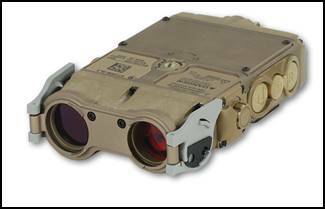 1-508 PIR DOS O/H: ( ), DOS Short: ( ), Short $(244,625.72) - 54% of supply. 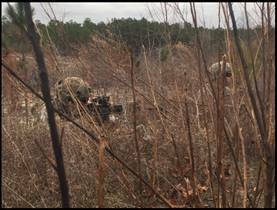 Over 20 – 21 February, BN and CO level leadership conducted a PDSS to Fort AP Hill, VA to recon Squad Live Fire ranges along with other training objectives for the AP Hill OPT. In total, 1-508 PIR is prepared to conduct one mounted maneuver gunnery range, three separate squad live fire lanes, one scout break contact lane a battle drill 6 live fire, a Mortar CFF exercise and sniper long range marksmanship. Line of Effort #2: “Win Tomorrow’s Fight”. Initial company feedback from Platoon level leadership regarding the iMBITR's ability to receive and transmit narrow and wide band nets is excellent. Squad leaders and Platoon leadership agree that the new ability to utilize two nets with a set of Peltors increases each leader’s situational awareness. Line of Effort #3: “Paratroopers for Life”. 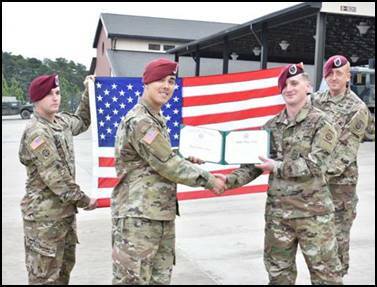 C/1-508 PIR reenlisted three Paratroopers this past week. SSG Dwyer reenlisted on Drill orders, SGT Allen reenlisted for Ft. Hood to be closer to family, and SSG Benson reenlisted to stay here on Ft. Bragg. HHC/1-508 PIR reenlisted two Paratroopers; SPC Metzger from the scout platoon reenlisted for another 3 years and SGT Thompson from the medics re-enlisted last week as well. 1-508 PIR executed this month’s division retirement ceremony for six Paratroopers. LTC Mcchrystal provided the keynote address celebrating their commitment to our Army and asking them to be an ambassador for our Division as they transition out of uniform and into civilian life. Line of Effort #4: “America’s Guard of Honor”. 1-508 PIR prepares to transition GRB responsibilities to 1-505 PIR, and supports the brigade in ORA requirements and DRC change over. Over the next two weeks 1-508 PIR will continue to finalize details for the Battalion OPT at Fort AP Hill. D/1-508 PIR will outload and conduct movement to Fort AP Hill in preparation for Gunnery Tables V-IX. Paratroopers will conduct CBRN, medical, and air assault training as part of the crawl, walk, run construct leading into a series of platoon/company operations in an urban / SUB-T / dense wooded environment at Fort AP Hill as a culminating event.